“Declutter,” “tidy up,” and “get rid of stuff” are mantras that many modern homeowners live by. But in your passion to organize your house (and your life), don’t neglect that large expanse of outdoor real estate … your yard. 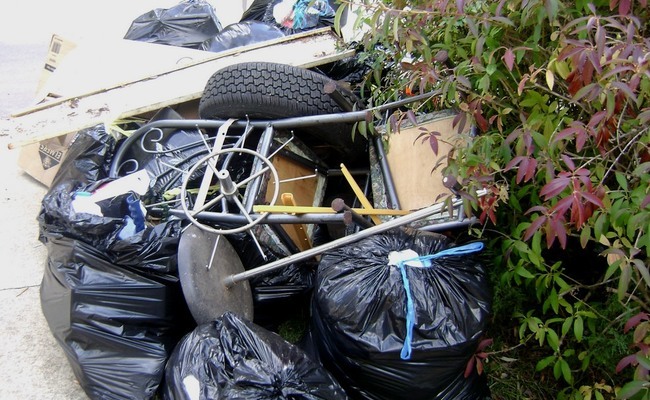 Make it beautiful, livable, and safe with these yard cleanup tips. Find out facts. Check out essential information about yard waste removal, including municipal pickup dates and times, local recycling center location, and bylaws related to burning garden debris. Schedule. Choose a time slot when you’ll be able to devote a stretch of several hours to your yard work, like a weekend morning (not too early – you don’t want to disturb your neighbors or risk the wrath of your HOA). Gather equipment. Here’s a recommended list, depending on the size and condition of your property. Some tools can be rented. Garden tools, such as a mulching mower, leaf blower, rake, branch lopper, pruning shears, shovel, trowel. Trash. Clearing out obvious trash like food wrappers and dog poop as your first yard clean up task will give you a pleasant sense of accomplishment. Dangerous trees or branches. An unsound tree or limb – whether dead, damaged, diseased, or infested – poses a danger to people, animals, plants, and property. Trimming branches is often a feasible DIY project, but large jobs like tree removal should be tackled by a landscape professional. Weeds. Weeds are unsightly and a major curb appeal killer. In addition, these unwanted plants tend to be incredibly hardy, fast growing, and space hogging. Stop them before they choke out your grass, flowers, or vegetable garden. Stuff that attracts bugs. Pick up rotting fruit and vegetables from your garden. Eliminate potential mosquito breeding grounds by emptying standing water — from roof gutters and disused birdbaths. Stack firewood (a favorite hiding place for pests) up off the ground, away from trees or your house. Fallen leaves. Go over fallen leaves with a mulching mower; use the mulch you produce to protect your tree trunks, lawn, and garden beds. If you’ve got more than you can reasonably handle, rake them to the curb and pack them for pickup. Garden clutter. Tidy your garden beds. Remove any plant that didn’t work — or that you just dislike — to make space for new plantings. Give live plants to neighbors or members of your garden club. Compost dead plants, unless they’re diseased. In that case, burn or bag so they won’t infect future plantings. That mess of tools. Repair or recycle broken implements. Keep usable tools in good shape by cleaning (disinfecting, too, if they’ve been in contact with sick plants) and oiling. Then put them away neatly in your garden shed – that’s what it’s there for! Extra plant pots. Scoop up any clay pots you’re not currently using and get them inside before they’re cracked by winter’s cold. Are you saving the thin plastic pots that nursery plants came in, hoping you’ll find a use for them? Cut the clutter by freecycling or, in some locations, recycling. Outgrown toys. Once your kids have grown taller than you, hang on to a few cast-off Legos or teddy bears if you must – but outdoor swing sets, climbing frames, and water slides take up substantial space in your yard. If they’re in good enough shape, sell or donate. Unsafe fence or railing. As part of your yard cleanup, check fences and railings. A decayed or shaky rail or post is an accident waiting to happen, especially on an elevated deck or around a swimming pool. Get any of these safety hazards replaced pronto. Algae. On the side of your deck, it’s just ugly, but on a garden path or steps, algae growth can be slippery and downright dangerous. Remove by scrubbing small spots or pressure washing larger ones (and consider improving drainage in this area, to control the problem in future). I wish my neighbor would read this!! Thanks. Check to see how your yard waste collector wants you to prepare it for collection day, or the rules for the collection site if you need to haul it yourself. Also, check the fire codes.